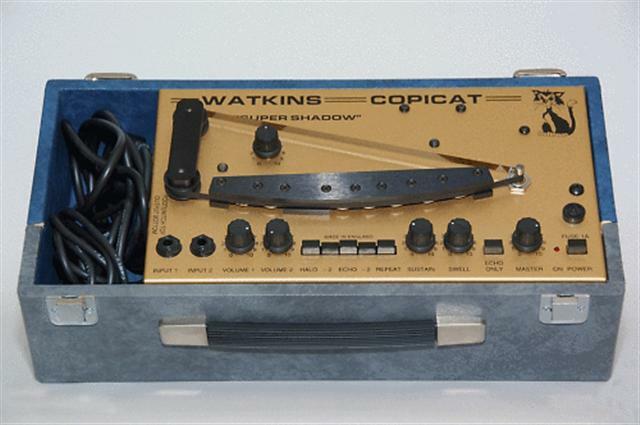 This is a roughly chronological list of the many Copicat models which have been produced over the years. Below are some illustrations of the different types. 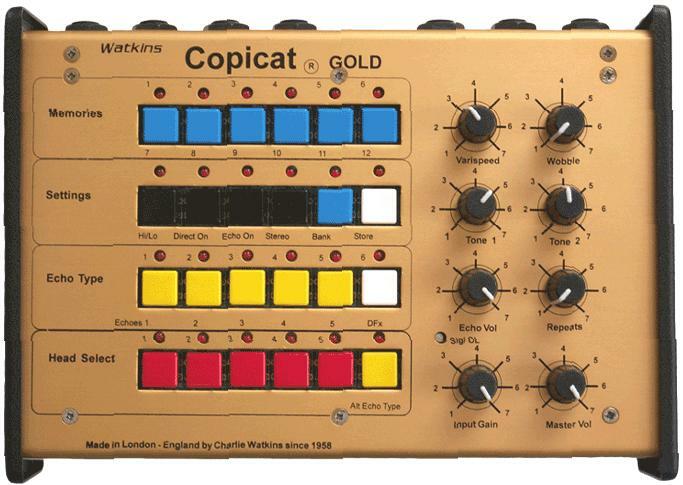 Charlie tells the story of how he was reunited with Copicat No.1 on his website. He had offered a reward of £1000 to anyone with the machine. Someone from Liverpool returned it anonymously and said "keep the money". Charlie said it restored his faith in human nature. What a wonderful gesture! 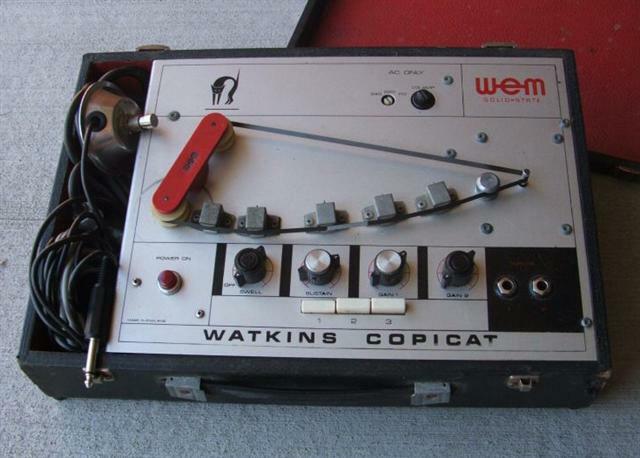 There is some controversy about when the first Copicat was actually produced. 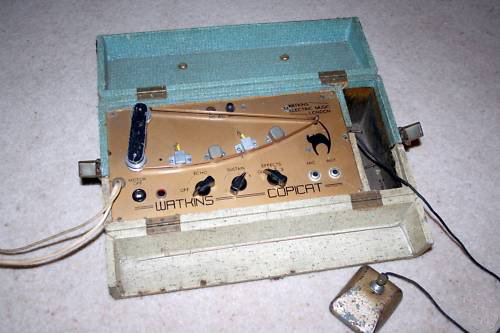 Charlie usually says 1958 (earlier in the NAMM interview above) but Bill Purkis, the designer of the Copicat electronics did not join the company until 1959. 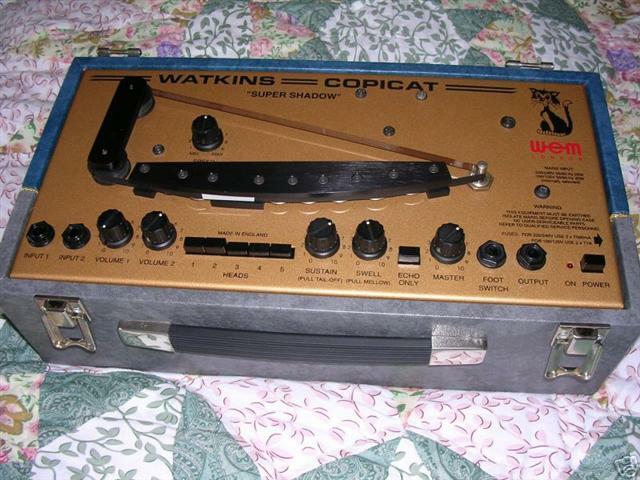 Johnny Kidd supposedly bought one of the first Copicats and used it on his top ten hit "Shakin' All Over" which was in the summer of 1960. 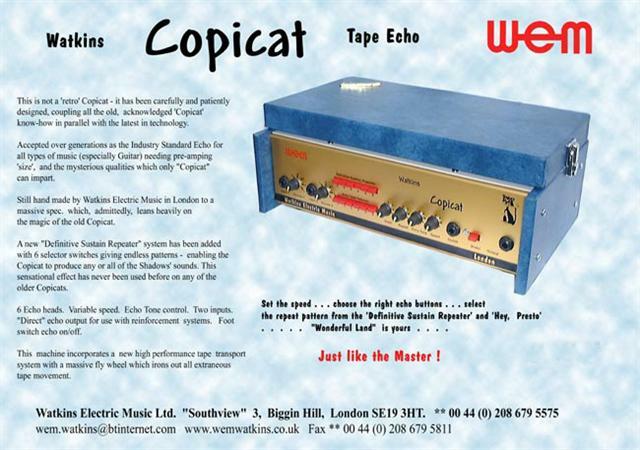 Melody Maker first mentioned the Watkins Copicat in September 1960 saying "New, available shortly". My view (with no reflection on Charlie's integrity - it was fifty years ago!) is that commercial production most likely started in early 1960. 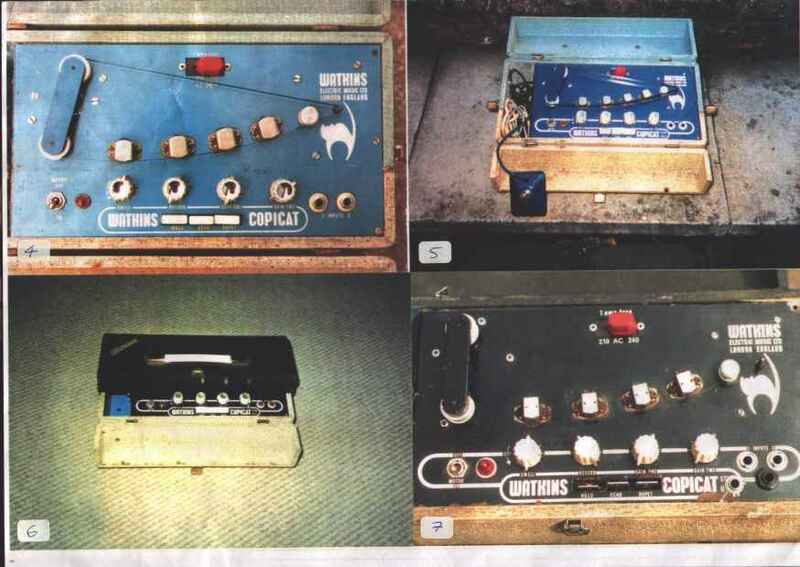 Thanks to Paul Day for his Melody Maker research and extract from his Watkins Timeline. I would be glad to hear from anyone who has any evidence for an earlier date or confirmation of 1960. Date codes on electronic components would be useful. Probably manufactured about 1961/62. Push buttons have replaced the rotary head switching of the Mk1. 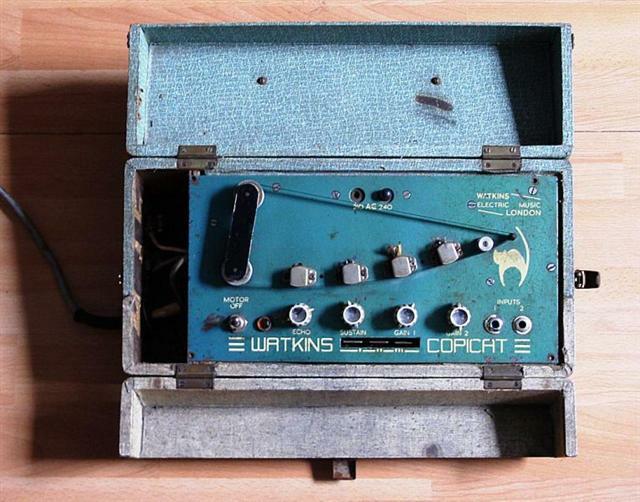 A fine example of The Shadow Echo valve Copicat. With thanks to Pete Haycock for permission to use the picture. This one belongs to Pete Haycock. Pete is particularly impressed by the valve preamp section of the unit and when recording, he often uses this alone without the echo. It uses three playback heads and a simple but effective permanent magnet erase system. 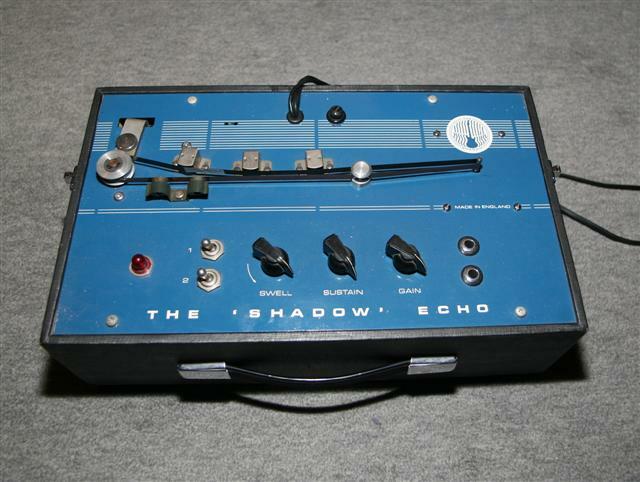 The circuitry was slimmed down in the Shadow Echo such that only two valves were used (see below). A silver face version of the WEM Shadow Echo with repositioned erase magnets. 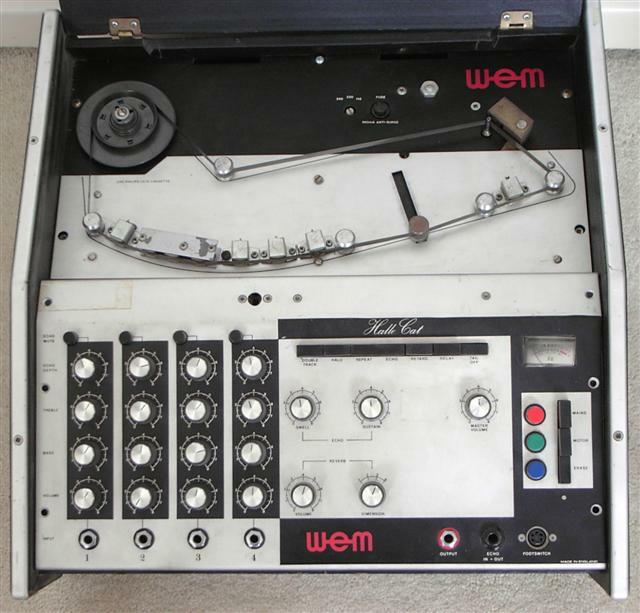 The earlier positioning is likely to have caused magnetisation of the recording head which would partially erase the tape passing over it and degrade the sound quality. 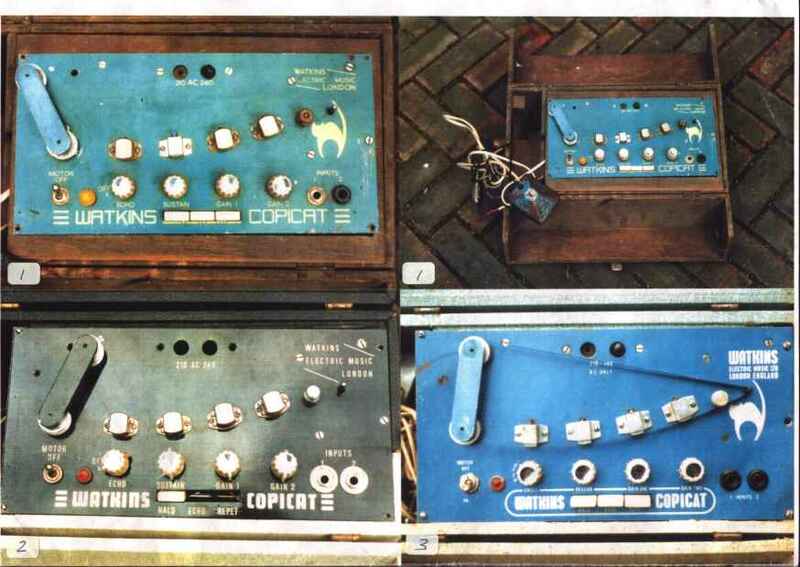 "Despite popular belief that the preceding Mk.1 and 2 Valve Copicats® were the best performers, the facts are that this first departure from valves, was by far the more successful. 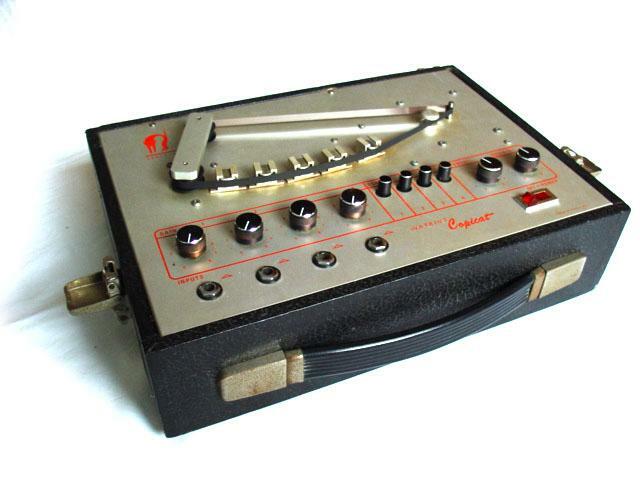 This was mainly because of its early transistor state of the art design with its greater stability and greater recording bias control. It also had, by this time, developed far superior tape transport components. This model was sold by the 100's of 1000's all around the world. Most of them are still running nowadays. 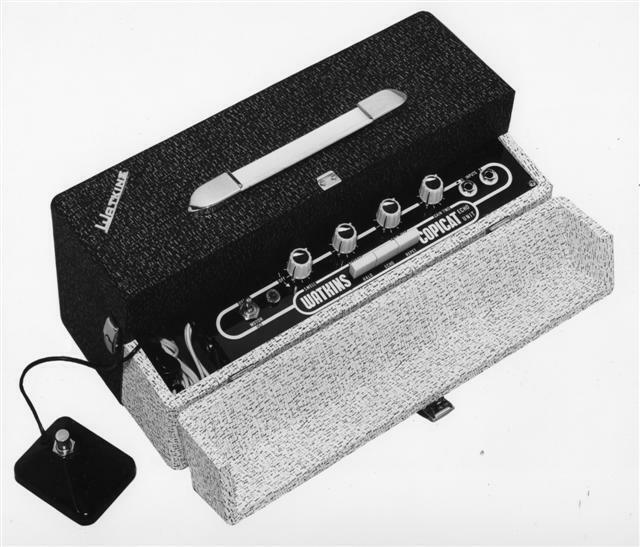 Incredibly reliable, with its superior dynamic range (of great importance when used for voice) and vastly improved erasing circuitry its only offset was the prevailing nostalgia and love of valve circuitry. 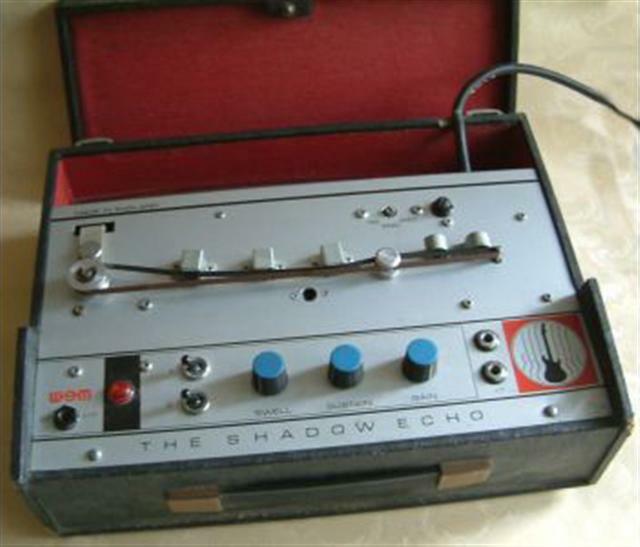 But as an Echo Unit it outshone everything else the world had to offer. 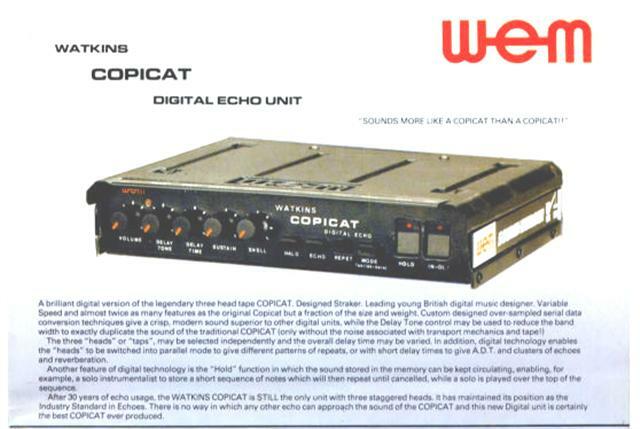 Although new digital technologies have made it possible for the unique and original Copicat sounds to be emulated and actually improved upon - nothing will ever be taken from the original pioneering Copicat - which climbed the mountain first!" "Copicats? I could go on at length. 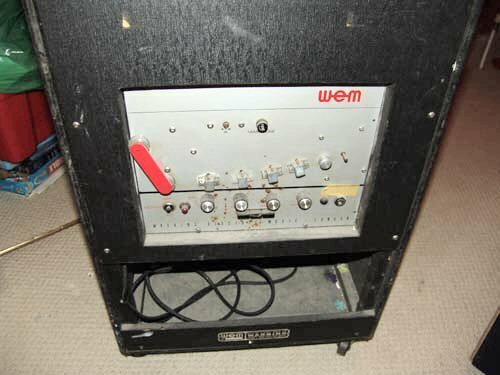 I've been fixing/modifying/restoring these machines ever since Charlie started producing them. Yes, the transistor models are technically superior (just!) but the valve versions SOUND better. Due to the design, they need to be fed into a good 1M high impedance input (i.e. 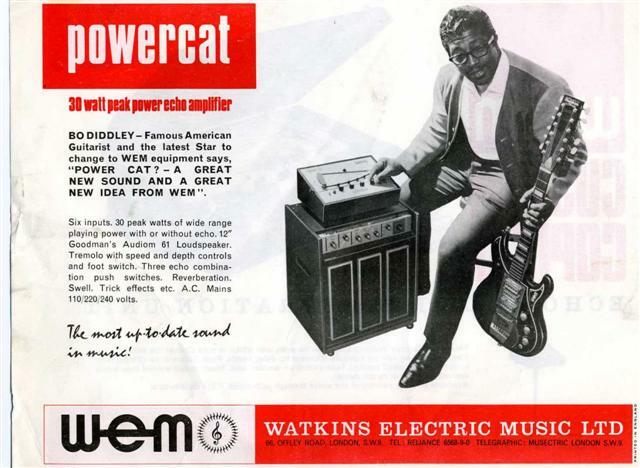 a valve amp) Even the models with the emitter follower output stage do not drive modern inputs well. Simple point missed 99.9% of the time. The later ic based machines are good too, apart from the ones with the "cassette" type heads, which lasted about a fortnight. Best of the later machines were the belt drive items, with steel faced heads. Very adaptable, varispeed, can easily be modified to sound like a Meazzi Echomatic for the Shadows fans. " Inside the MkIV Copicat - This model was produced in the greatest volume. 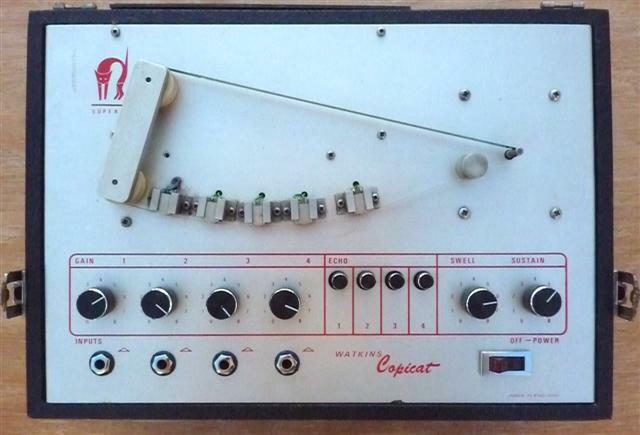 Copicat shown was made in 1975. 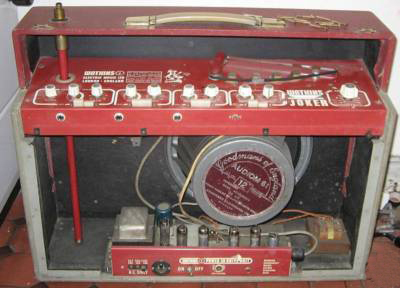 Note the direct drive motor/flywheel/ capstan arrangement used to drive the tape. 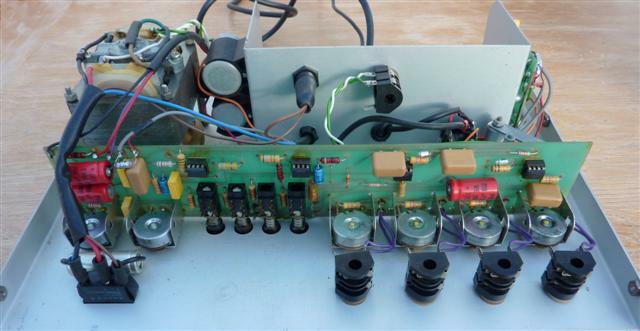 Just to the right of the mains transformer is the bias oscillator circuit now separated from the main PCB. This model is shown prior to renovation. As they left the factory there was no earth connection and only two core mains cable. 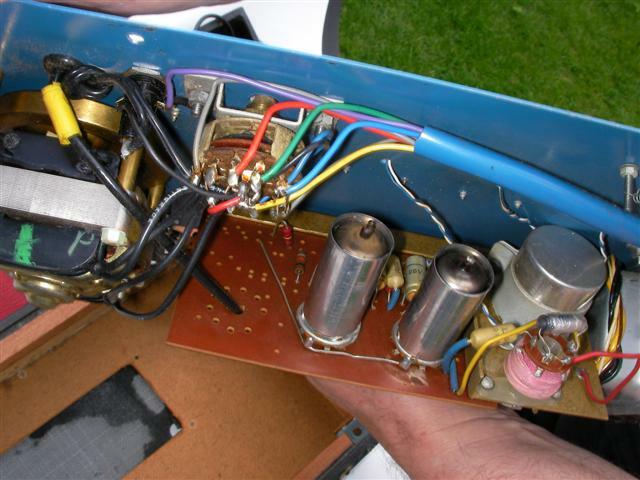 Since there is a metal chassis, Copicats of this age should always be rewired to include an earth connection in case the metal parts should become live due to an insulation breakdown. The circuit of the Super IC was simplified by using four 741 op amps in the amplifier section and two BFY51 transistors in the bias oscillator. There is a clever economy which uses a winding on the capstan motor to generate the low voltage for the electronics. This removes the bulk of the usual mains transformer and means that the leads and footswitch can be stored in a rear compartment and makes the whole thing much neater and lighter. This is something of a rarity. 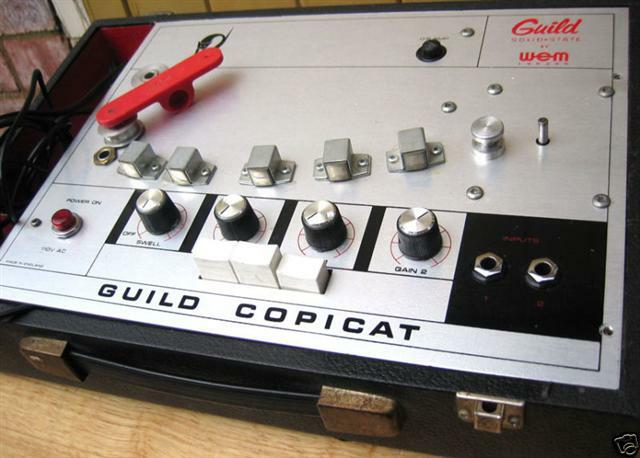 The Halle Cat was designed as a Copicat with combined 4-channel mixer. 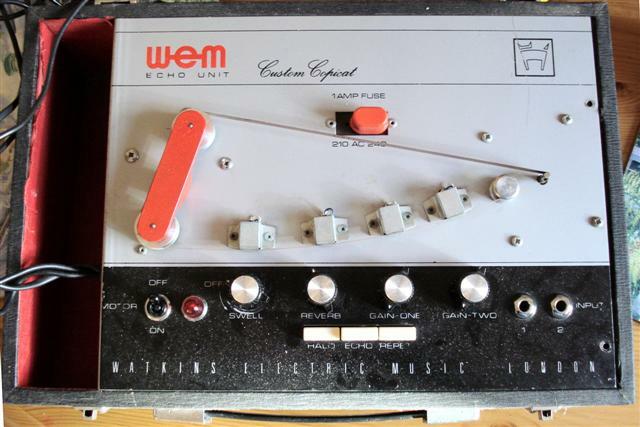 Originally fitted with a continuous loop Phillips CE10 cassette which caused problems from the outset. 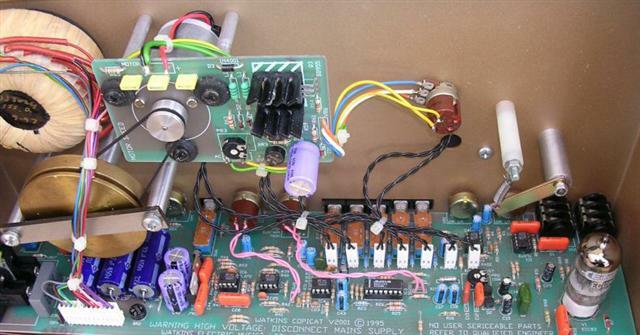 Modified to use a more conventional tape loop. This model was not a commercial success and was soon withdrawn. "Too expensive - too complicated" - Charlie Watkins. 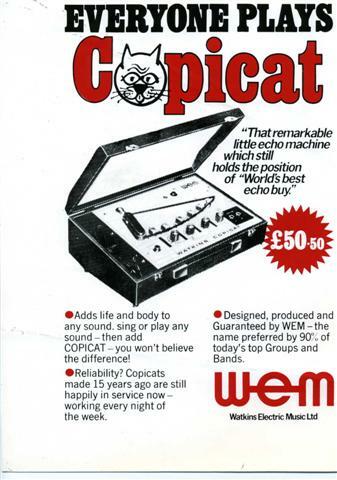 The Halle cost £250 in 1975 when the standard Copicat cost £76. Halle means echo in German and the name is also a play on words with 'alley cat'. "The IC 500 employs no less than 3 charge coupled devices where the normally acceptable echo unit would only use one. 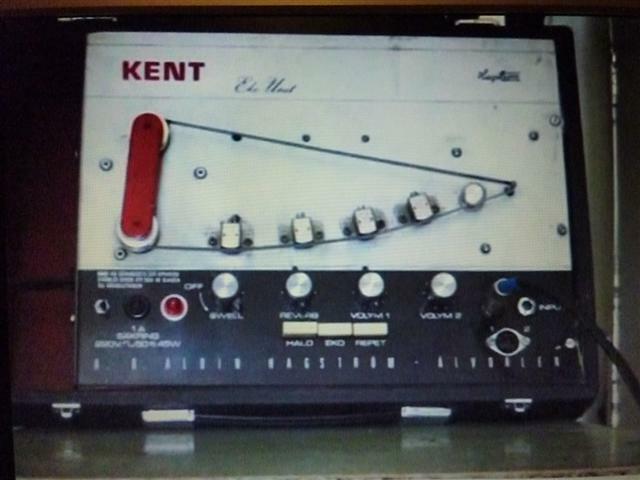 This provides the special feature of unequally staggered delay "heads" and allows the unit to perform with a frequency band from 20Hz to 4kHz even at maximum delay time of 0.4 seconds. The IC500 is provided with 36dB anti-aliasing filter effectively removing spurious and harsh frequency interference." 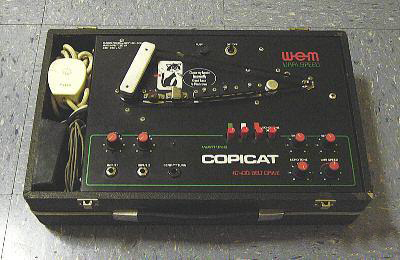 From the 1990s this was a very much upgraded Copicat which returned to traditional valve powered electronics but also incorporated Varispeed facility from the later IC400 Copicats. 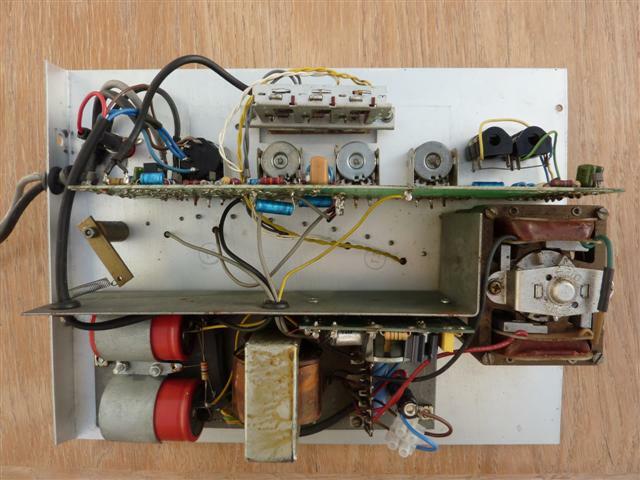 Inside the Super Shadow Mk2 shows the toroidal mains transformer and hybrid circuitry using both integrated circuits and a single pre-amp valve. Variable speed motor now drives a heavy flywheel via a belt. Still the tape echo but controls are now forward mounted. "Definitive Sustain Repeater" facility added giving endless repeat patterns. 6 echo heads and variable speed. 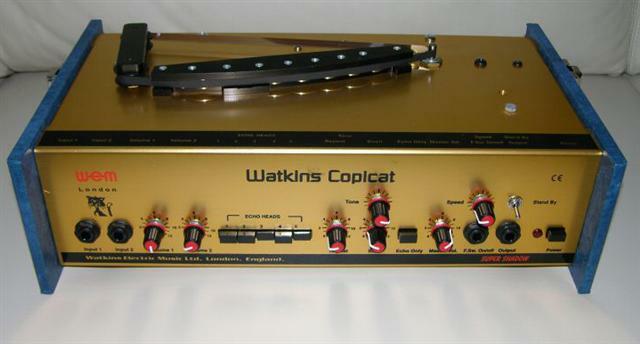 The 2009 ultimate Copicat from Charlie Watkins. 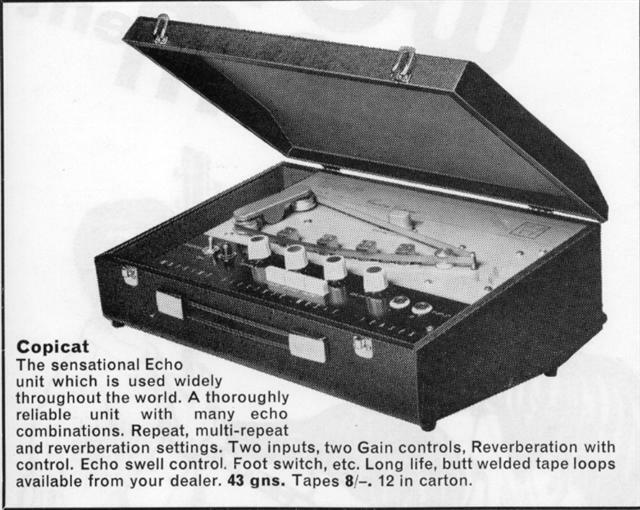 Almost infinite combinations of echo effects are possible which can mimic not only the original Copicats but also the classic sounds of Binson, Meazzi and Space Echo. It can even imitate the slight tape wobble produced in the orignal direct drive Copicats. All this and a bank of memories to reproduce custom combinations of effects. 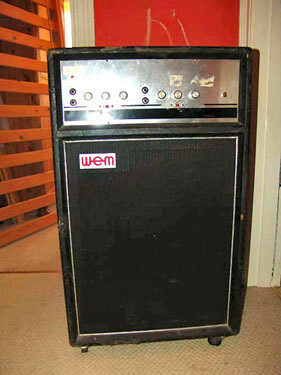 Contact www.wemwatkins.co.uk for further details and to hear some excellent sound clips. 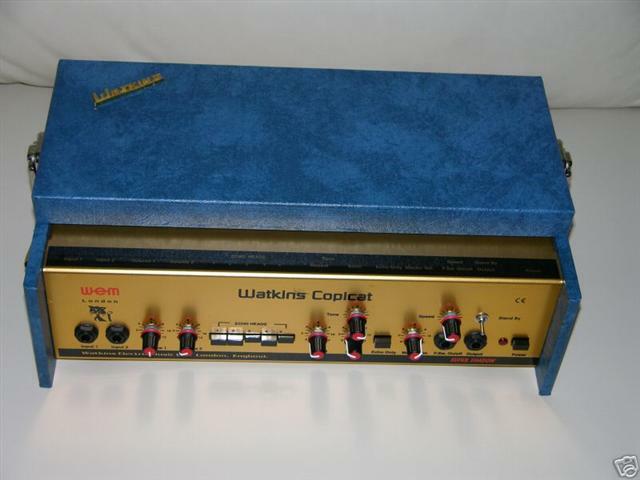 The Watkins Scout amp combo contained a valve copicat and a microphone stand presumably to cater for a solo singer/guitarist. The pictures below were sent to Charlie Watkins by a Copicat collector for him to identify. His comments are listed below the pictures. This is an early Mk2. 1959/60 The little ticks under the push switches were meant to denote the head which was selected. The box is not original. I had just bought a new Ford Consul Estate and went to East Ham to collect a can of special blue metallic cellulose which I fancied for the deck. On the way back, Sniff,Sniff!! Funny smell. Stopped, investigated. Lid off the cellulose all over the back of my new car. Just saved enough to do the MkII run. Bit of mystery to me. I don't remember this colour or design. Must be MkIIish, IIIish. All within a year of each other. This is the model which stormed Europe by the thousand. Guild Guitars staggered me at the 1961 Frankfurt Music Fair by handing me an order for 1000. Black or Blue has no significance. The colours used to change with my brain storms and fluctuations. All were designed by Bill Purkis and were generally credited with being the main ingredient of the now legendary "Sound of the Sixties". The heads on photo 4 & 5 are original Marriotts . Thanks to Keith Smart for permission to use the above pictures and text.